With the news of an impending hurricane coming straight to South Florida from Sept. 9 to Sept. 14, news also arose that within those days, over 4,000 people would take to the streets of Coral Gables, lower their center of mass, fly their arms behind their torsos and channel their inner “shinobi.” All in the hope to escape the destruction of Hurricane Irma, just as the legendary Naruto might. Seeing that he now had a large audience, Torres used the opportunity to remind the “attendees” to take precautions to stay safe during the storm. Torres’ event was far from the only satirical hurricane event to gain notoriety. 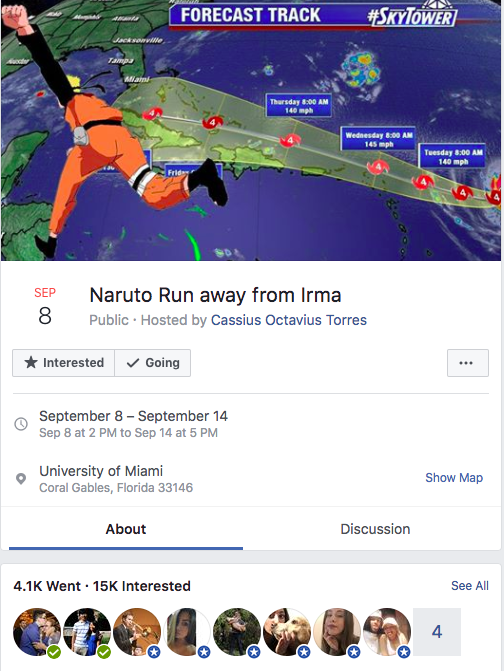 Once it was announced that Hurricane Irma was to hit South Florida, numerous satirical events have popped up on Facebook. Each one offering a unique solution to combating the effects of the storm, and in some cases, the storm itself. 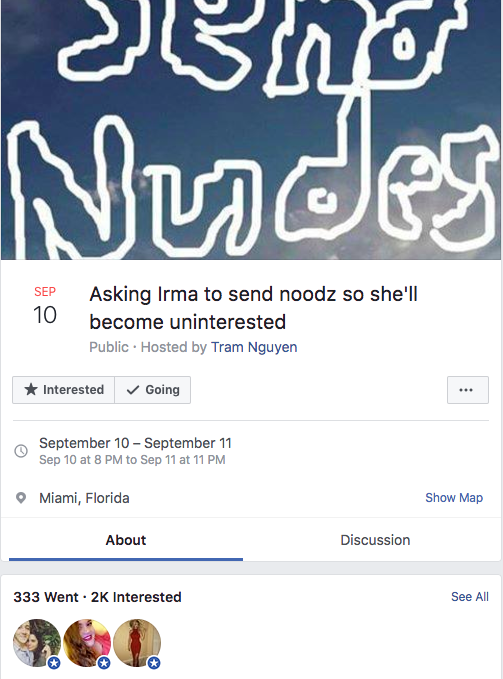 Among the popular events is “Asking Irma to send noodz so she’ll become uninterested,” created by UM finance and economics student Tram Nguyen. Other UM students took the satirical concept even further and used the Irma events to poke fun at aspects of the university. 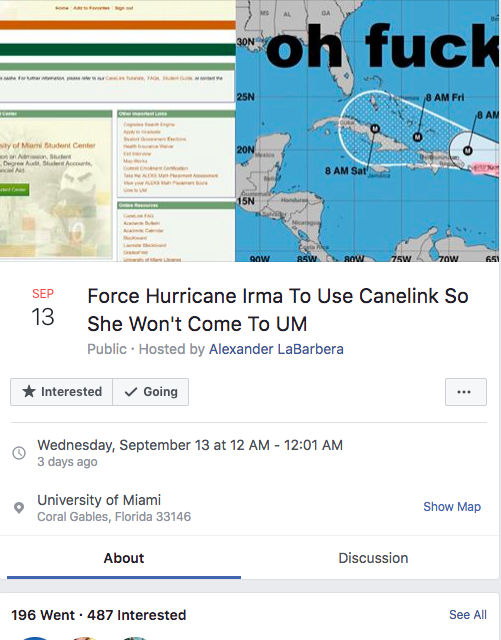 “Force Hurricane Irma to use CaneLink so she won’t come to UM,” created by microbiology and immunology major Alexander LaBarbera, is just one example. “CaneLink has become a meme of its own on campus,” said LaBarbera. “It was an easy target.” CaneLink, the university’s online student service, is often lauded by students for its “clunky and non-user-friendly interface,” LaBarbera said. These events are becoming so popular because of the increasing cultural relevance of comedy as a coping mechanism, along with a dash of self-deprecating humor we normally see on social media sites like Twitter.